Pete Skomoroch and Jon Bruner will be hosting O'Reilly Bot Day October 19, 2016, in San Francisco. Behind the recent bot boom are big improvements in artificial intelligence and the rise of ubiquitous messaging services. 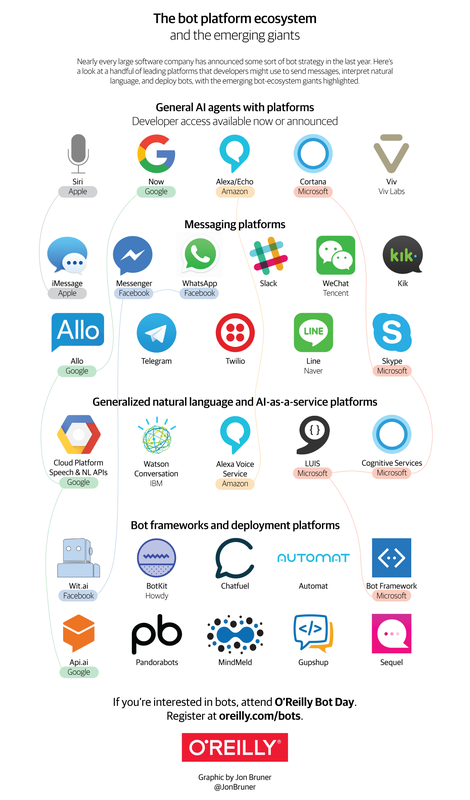 In the graphic below, I've listed some of the most important AI, messaging, and bot deployment platforms, and have also highlighted the emergence of a few interesting stacks: Microsoft, Amazon, Google, and Apple each control a general AI agent as well as at least one entry elsewhere in the stack—and Facebook may not be far behind with its M agent. Article image: Bots landscape. (source: Jon Bruner).